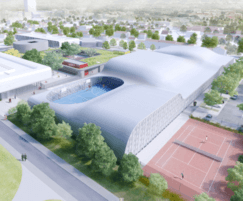 A sports complex for Clamart in France includes a gym, a track and field area, and a tennis court, all within one floor. 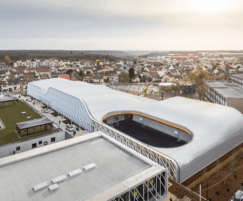 The complex is shaped to follow the curves of the landscape and the innovative use of Kerto® LVL (laminated veneer lumber) enabled an organic curved design for the building's roof. 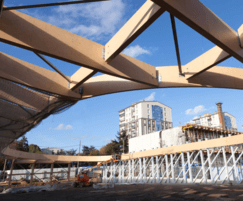 Kerto® LVL rafters were used for the building’s frame and roof structure covering an area of 5200m2 and connecting the façade and roof together with a continuous structure. The product matched the technical, structural and financial requirements of the project. 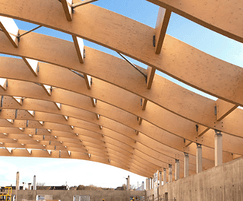 Kerto® LVL enabled long spans and complex curves for which the sports centre is now famous. 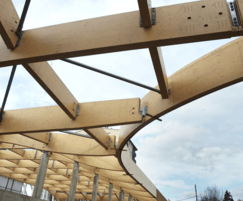 The engineered wood frame also proved to be economical, structurally efficient and visually attractive.